Published by Cyril Huze September 12th, 2015	in Accessories, Builders, Driveline, Editorial and Engines. 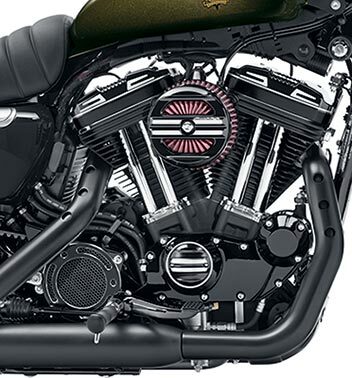 Offering a more aggressive attitude with an edge, the new Rail Collection of engine covers for late-model Harley-Davidson® Sportster® motorcycles gives the powertrain a broad-shouldered look that mixes well with café-style or urban-assault custom projects. Offered by Harley-Davidson® Genuine Motor Parts & Accessories, each component is factory-engineered to assure perfect fit and function. A durable gloss-black finish is highlighted with machined longitudinal strakes that add visual length to the powertrain. Sportster owners can add select components or go all the way with the entire Rail Collection. 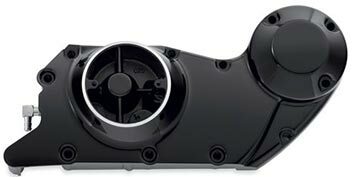 • Gearcase Cover (P/N 25700533, $274.95) Fits 2004-later Sportster models. 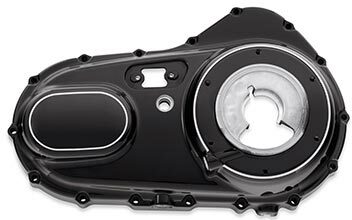 • Transmission Sprocket Cover (P/N 34800032, $169.95) Fits 2004-later Sportster models. • Rocker Box Lower Housing (P/N 25700600, $159.95) Sold in pairs, fits 2004-later Sportster models. • Upper Rocker Box Covers (25700531, $279.95) Sold in pairs, fits 2004-later Sportster models. 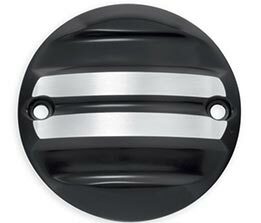 • Derby Cover(P/N 25700541, $149.95) Includes chrome mounting hardware, fits 2004-later Sportster models. 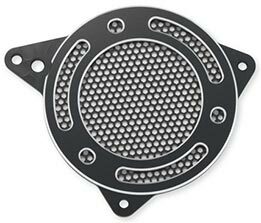 • Timer Cover (P/N 25600060 $64.95) Includes chrome mounting hardware, fits 2004-later Sportster models. • Primary Cover (P/N 25700532, $259.95) Includes gloss black chain inspection cover, fits 2006-later Sportster models. Chopped timing cover. Harley catches up to old customs again. Look good. Very edgy, and aggressive with some attitude mixed in as well. It will surely make me feel like a real man, and as usual at a low low price. A bargain really to obtain edginess. And so the “industry” is basing its value to the customer on the basis of the product’s capability to to do what…??? ….. Provide a personality accessory. So how does the R&D to develop such functionality actually work…??? In the past it was hard mechanical & electrical engineering, proven out on the race track, that advanced product quality and value. Who-zat work in today’s world, i wonder….??? Oh ya, i forgot… Today we are graduating more Sociologists than Engineers. So the products are now based on “feelings”….. Sorry, i was momentarily distracted by an older reality, where form once followed function. Lowest bid junk as usual…. I don’t know about the rest of you, but Nicker scares me! Lots of scary things going on in that basement I am sure. SIGFREED: and he is correct with both statements. Long live the Sportster. It’s a great bike. Well, “100/100” =1… nothing negative about it. What should scare-ya is where “motorcycling” is going …. via marketing. Instead of an industry concentrating on advancing the product….. the only thing being advanced is an “image”…. And not an image of the classic motorcyclist…. the capable, self sufficient individual, but a clueless poser looking to enhance a personal image without doing any real work to that end. Shoot the messenger if ya like… but it is what it is. Sure I’ll put 1400 dollars plus about that in labor to make my 11,000 dollar XL look edgy. Add the Fat Chizeled Apes too. 4000 bucks to make my Sportster edgy. Where the hell do people get that kind of money? I may be cheap but before I spend 15K for a new Sportster, I’d spend half of that and get an nice used FXR and a used Suzuki DRZ 400SM and ride the snot out of both of them. I’m equally frightened by those who seem to argue an old Dodge Neon makes sooooo much more sense than a new car. If it makes ya happy and doesn’t use up the food & bourbon money, what’s so horrible about throwing money at your bikes?